Explanation: Arachnoids are large structures of unknown origin that have been found only on the surface of Venus. Arachnoids get their name from their resemblance to spider-webs. They appear as concentric ovals surrounded by a complex network of fractures, and can span 200 kilometers. 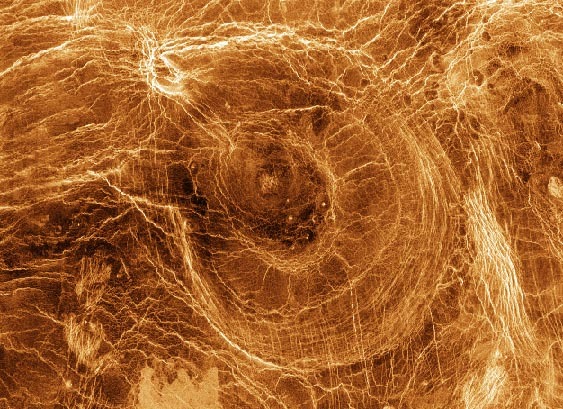 Radar echoes from the Magellan spacecraft that orbited Venus from 1990 to 1994 built up this image. Over 30 arachnoids have been identified on Venus, so far. The Arachnoid might be a strange relative to the volcano, but possibly different arachnoids are formed by different processes.